Supply, installation and servicing of pre-engineered foam fire suppression systems for all types and sizes of mobile plant, equipment or vehicles, including a range of hand held fire extinguishers. Hydraulic breakers, cutter crushers, multi- processors, pulverizers and boom-mounted breakers. 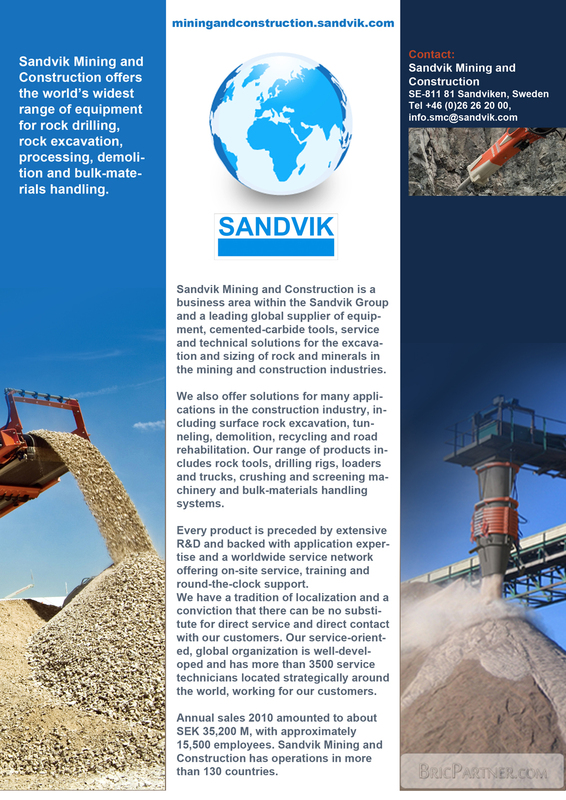 Designed to meet the needs of mining and construction professionals, Sandvik breakers and demolition tool ranges are capable of delivering the necessary amount of impact energy, cutting force or crushing force to handle even the toughest of applications. With high power to weight ratios, easy interfaces and simple connections, they can transform any carriers into highly productive demolition machine. Turnkey installations. Bucket wheel excavators, belt wagons, spreaders, transport crawlers, stackers, reclaimers and ship-loaders/ unloaders. Turnkey conveyor installations, components and parts. In-plant, in-pit, overland and underground systems. Sandvik can design, manufacture and install virtually any kind of conveyor system. From high-speed overland systems to opencast mine conveyors, flameproof underground systems, tunnel conveyors and in-plant process conveyors, we have the know-how and the resources to deliver complete solutions. We also undertake upgrading and modernization projects and supply a comprehensive range of quality components and wear parts. Jaw crushers, impact crushers, cone crushers, vibrating screens and feeders. Automation systems. Complete stationary and mobile systems. Continuous miners and bolter-miners, roadheaders, reef miners and boxhole borers for mining and construction. Underground loaders, LHDs, haul trucks, shuttle cars, low-profile dozers and compact face shovels. Small and large crawler and wheel-mounted drill rigs, multi-boom drill jumbos and roof bolters, hand-held rock-drills. Drill bits and complete drill strings and systems for all kinds of rock drilling. Cutting tool systems for mining, trenching and planing machines.